Eighth-grader Maira Barros rode the red line alone from Fields Corner to the JFK stop on her way to the McCormack School. 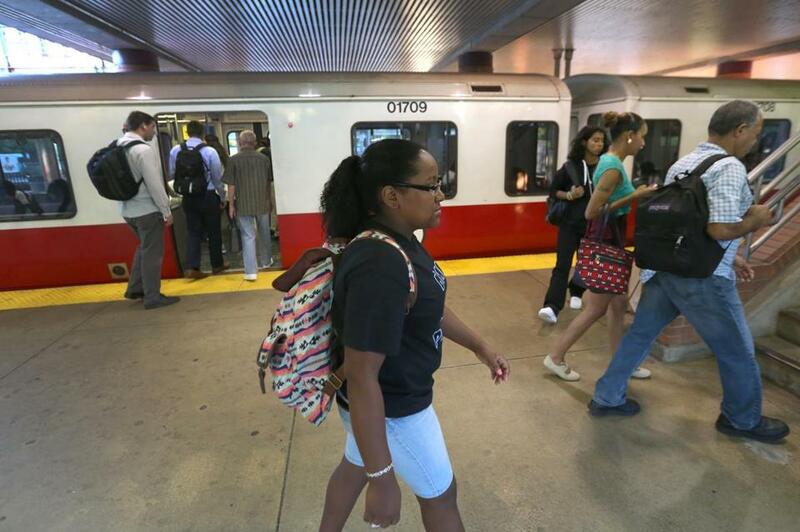 Boston eighth-graders took to the MBTA this morning with a mix of trepidation and nonchalance, some accompanied by frustrated parents and others flying solo on the first day they have been required to ride public transportation instead of yellow school buses. While she said her friends had the same laid-back reaction to the news that they’d have to take the train, some of their parents insisted on coming with them on the first day of school -- and her friends weren’t thrilled, she said. “They say it’s embarrassing,” Barros said, smiling. In an effort to trim $2 million from the budget, the School Department this year reduced bus service for eighth-graders, putting about 2,100 additional students on the T. The plan has raised some safety concerns from parents and advocates, who say 12 or 13 is just too young to be required to traverse public transportation alone. Others have worried that the change could lead to attendance problems, or that the thousands of additional riders could overburden the transit system. 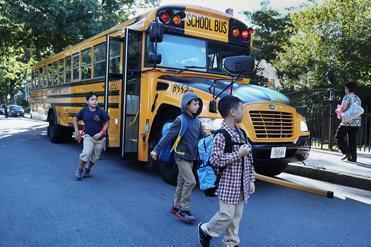 Boston public school students set out for classes Thursday morning. Mitzi Sweeney arrived at JFK station with her 13-year-old son, Raymond, on their way to the Richard J. Murphy School this morning, determined to obtain a waiver for her son to be allowed to ride the yellow school bus. Their journey this morning included a trolley from Milton to JFK train station, the Red Line to Fields Corner, and then a bus to school. Mitzi Sweeney, who works at Lord & Taylor, said she has a customer whose 16-year-old son was murdered at Fields Corner coming home from school. It was the first thing she thought of when she got the notice that her son had to ride the train. Sweeney said she was not against the plan in general — “I guess it’s teaching them responsibility” — but for her son, the combination of Fields Corner station with the overall length of the trip, means the yellow bus is the best choice. This morning, MBTA officials were out in force, handing out laminated “Back to School Blitz” cards with links to important websites, Twitter handles and e-mail accounts for students, parents, teachers, and city officials. “The MBTA is on top of this,” said Superintendent of Subway Training Charles Murphy, as he walked back and forth across Fields Corner station talking to parents who were accompanying their kids. City Year workers had also spread out in their red jackets across train platforms, though they were finding that most of the eighth-graders were pretty confident. Evan Allen can be reached at evan.allen@globe.com. Follow her on Twitter @evanmallen.